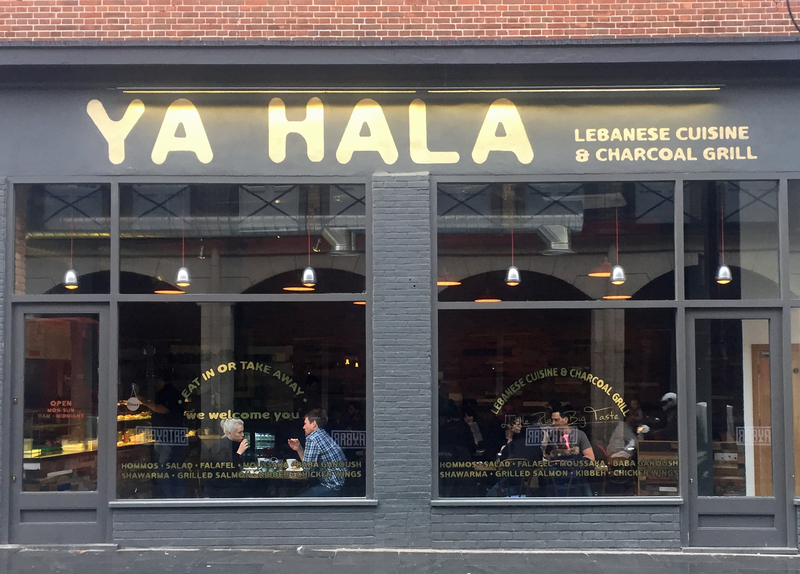 Ya Hala is an offshoot of a successful restaurant of the same name in Paddington. We arrived just as they opened for the first time. We were greeted politely with – “Will it be OK as we have to work on the door and it might be noisy”. We stayed. The place was nearly empty on a damp Saturday lunchtime but as the rain got heavier it quickly filled up. Most tables are for two people and seem immovable or at least so heavy you need help to squeeze in and out. But there is one large table with a comfy wraparound sofa for larger groups. It is definitely “designed”, having to fit into a rather odd shape dominated by the girders that support the hotel above. Walls have different finishes – blue tiles, parts of wooden boxes, paint and brick with one wall of glass so they must have seen the British Great Deisgn Challenge 2016. Situate yourself with the good view of Coldharbour Lane. 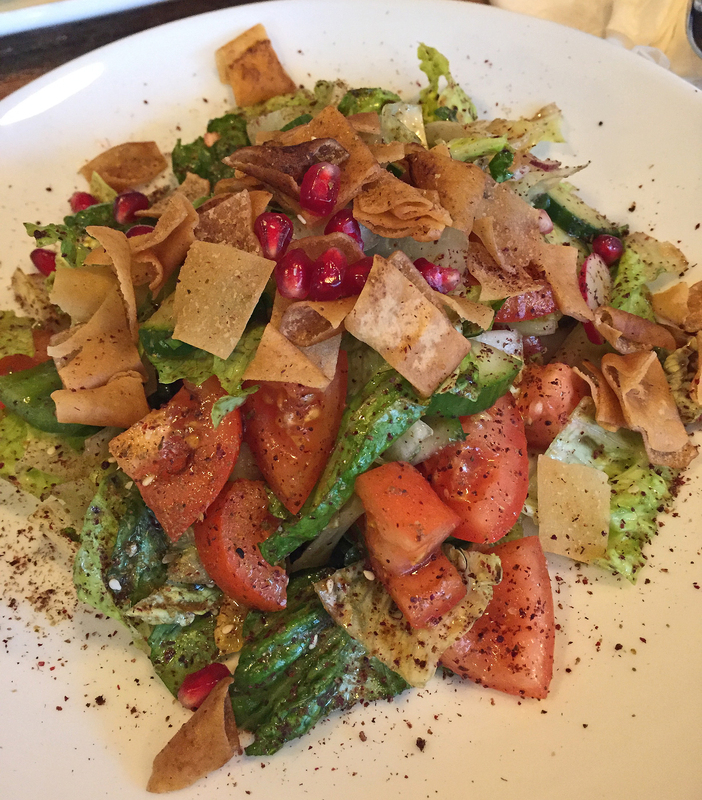 The menu is extensive but consists of putting together different elements of Middle Eastern cuisine into soups, sandwiches and cold and hot mezze. Chickpeas are in abundance in hummus and falafel. You can add minced lamb to almost anything but we didn’t, as there were enough tempting veggie options. 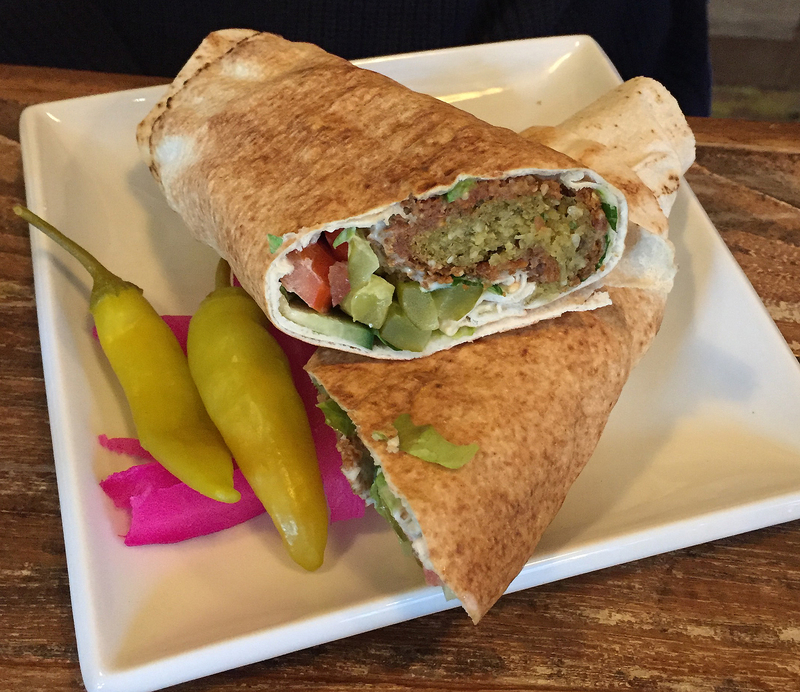 We ordered a falafel sandwich (make sure you are hungry or share), a fatoush (salad with pomegranate seeds and syrup) and mixed fried vegetables. The sandwich was very filling and warm for a cold Saturday, but the salad was particularly cold, so beware if you have sensitive teeth. It would be great on a hot summer’s day. The standout dish was the vegetables. Roasted and fried, needing no other seasoning than whatever they had added. 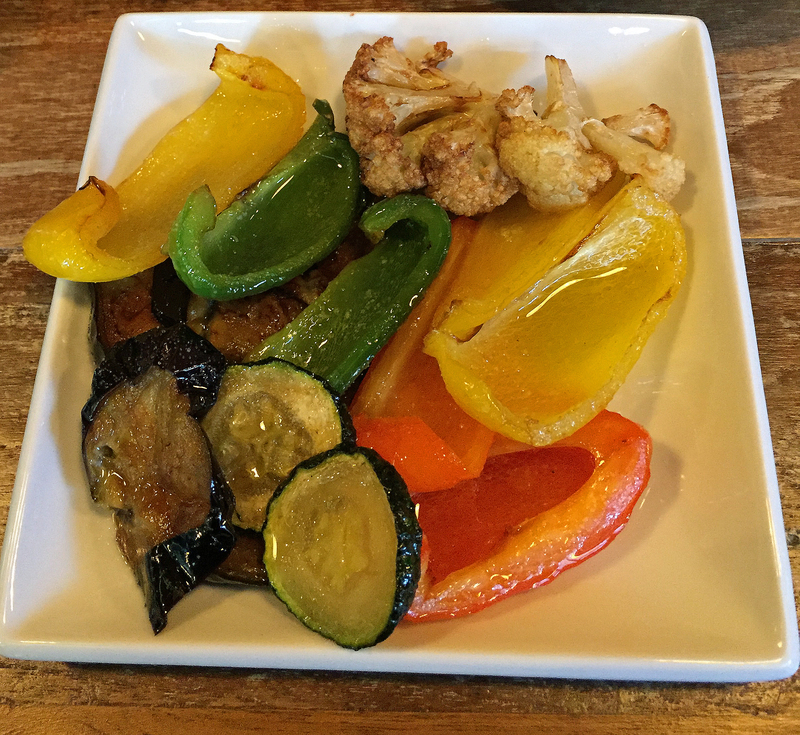 The cauliflower, pepper, courgette, onion and aubergine were fresh, warming and sweet and savoury in all the right amounts. We could eat this over and over. 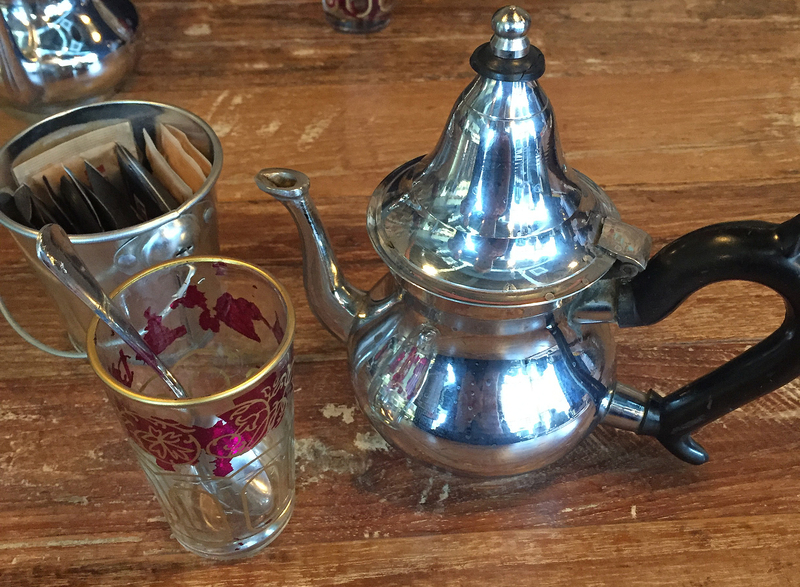 We washed it all down with tea – one was a special Lebanese tea made with rose, mint and cinnamon and the other a regular fresh mint tea. Both came in little pots with small glasses. There is clearly a knack to pouring so that it doesn’t run all over the table and we got it in the end. We only tried a lunch menu but there dinner menu is extensive, with a chef’s special, soup of the day and rice or chips to add as sides, in addition to the couscous. We will probably return for an evening menu. They are reasonably fast for a pre-Ritzy meal and it is only a stone’s throw away. The bill was £18.31 including a modest service charge. Nice atmosphere but did not like the service. Zero note the food had lots of oil, the waiters walked aimlessly or stood without doing anything or talking. I ordered the hummus after 10 minutes came the pitta bred did not like anything.